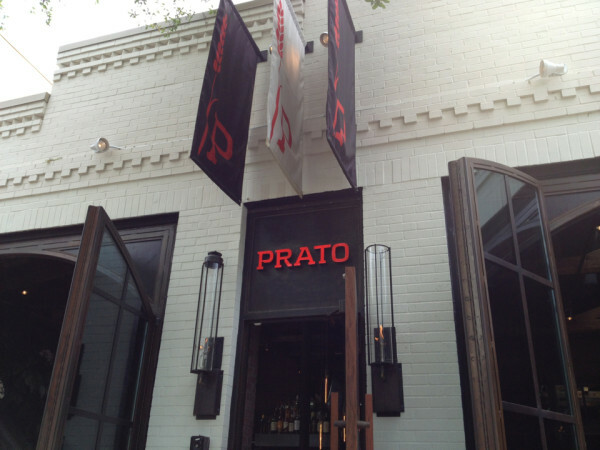 Prato – 124 N. Park Avenue Winter Park Florida. When restaurateurs are looking to open up a new restaurant or expand their concept, there are three very important factors to consider, location, location, location. Pick the wrong location and no matter how great the offer, attracting customers will be difficult and sometimes can be the death knell for the business. Location however is not a problem for Prato, as it is situated on what must be one of the most elegant and relaxing avenues in central Florida, if not the whole of the United Sates, Park Avenue. Park Avenue has long been the centerpiece of Winter Park since 1887, and a great place for a relaxing stroll in elegant surroundings, a unique destination for fine dining, fashion, and art in one of Florida’s most sought after and flourishing communities. Adjacent to a tree lined park that plays host to concerts and art festivals, Park Avenue is home to boutiques and well-known shops, sidewalk cafes and fine dining restaurants. Our review of Prato is compiled over many dining occasions and pulls together a composite view of what you can expect when dining here. Prato is very popular, so you can expect a small wait to be seated at peak times especially at the weekend so reservations are advised for larger parties. The décor is simple and rustic but thankfully has no over the top design theme, it’s just a relaxing place you want to spend time in and decidedly more casual and laid back than its sister restaurant Luma, located further along Park Avenue. The center piece of the restaurant is a long bar with theater kitchen and wood burning pizza oven at the rear, giving off great food aroma’s as you enter the restaurant. With its large window-paned doors and windows that span the front wall of the restaurant, year round sidewalk dining is achieved, Prato truly brings the outside into the dining area and is a great pace to people watch. So in terms of location, design, décor and atmosphere Prato ticks every box and then some. In terms of the menu, Prato takes its influences from Italian cuisine using seasonal ingredients and utilizing local suppliers, so you can expect small changes in the menu selections every few days. The menu offers a variety of small and larger plates, with brief descriptions about the elements of the dish without resorting to “food poetry” the food stands for itself in this regard. Prato Meatballs – with Roasted Tomato, Cipollini Agrodolce & Mascarpone polenta. These meatballs are deep and rich in flavor, served on top of an extremely well balanced Cipollini onion sauce reduction “Agrodolce” (sweet and sour) and some very tasty mascarpone cheese polenta, the meatballs are priced individually so are a great sharing appetizer or just to get you started, just pick the number depending on how hungry you are. The ominously named Widowmaker Pizza from the Wood Fired Oven – with Hazelnut Romesco sauce, Cavolo Nero, Fennel Sausage, Farm egg. Perfectly fired Pizza with soft egg sunny side up in the middle. Thin crust with blistered edges, this pizza does not disappoint. The attention paid to the blend of ingredients means no one flavor compromises the other, leading to one of the best Pizzas I have ever tasted. Farm Egg Rigatoni – “Fatta Su” Bolognese, Basil, Barolo – This little jem of a dish never fails to delight, deceptively simple in its creation, including delicate tubes of Rigatoni pasta tossed in a Bolognese sauce flavored with Basil and that rich Italian red wine Barolo, created “Fatta Su” (made from scratch) it makes you feel that your Italian “Nonna” has just shared her generations old recipe and cooked this just for you. Perfect. All meals are presented in simple style using rustic plates, bowls, containers and boards that do not detract from the menu item and lets the food be the “hero” not the container. Service at either the bar or seated in the restaurant is warm, efficient and knowledgeable without being obtrusive, all servers I have encountered demonstrated a genuine passion for the food they are recommending. As the wine selection is predominantly Italian, their knowledge is particularly important for those customers who are unfamiliar with the grape variety and names of regions. In this respect both your server and the bar tenders are more than happy and knowledgeable enough to guide you through some comparisons to your regular selection, and supply samples for you to ensure your wine selection is to your taste. Beers on tap include local brews from Gainesville based Swamphead Brewery and Tampa based Cigar City and of course no Italian restaurant would be complete without Peroni. I found the pricing to be average for the area but delivered good value for money, share a pizza for two over lunch with meatballs as an appetizer and a pasta dish to snack on, add a couple of glasses of wine for a tab of around $60 before tax and tip I think reflects this position. Try not to get seated at the rear of the restaurant, this may be unavoidable at peak times but food production takes place there and may not be to your liking. They have great family table situated at the side of the Wood Fired Pizza oven – Great for a family party and still be part of the atmosphere. Booth seating available and more than enough space to accommodate a party of four. The side walk can get very congested, consider the tradeoff between eating alfresco, people watching and your limited dining privacy. I liked Prato a lot, and I am not on my own, the eclectic crowd that fills the bar and restaurant tables is testament to its popularity, but popularity on its own is by no means a litmus test for good food or value, I am happy to say that in this case the popularity of Prato is well justified by the quality of food, service and styling.